I am not yet a subscriber but I will be shortly, based on the fact that, in a little over a month, you will be releasing a series I only dreamed about since 2007 - the much talked about, already revered, four-episode Gilmore Girls revival series, A Year in the Life. Recently I was faced with the realization of my reliance on your ability to perform, and now I have questions. Last week you somehow managed to hit us with what was practically a last-minute announcement of Luke's Diner Day in honor of our beloved Gilmore Girls. 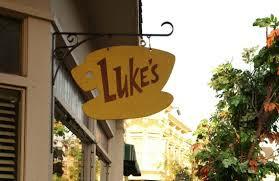 Every state in the country offered at least one "Luke's" that would serve free coffee, coffee, coffee all morning. In my attempt to be as close to the GG phenomenon as I could get even for a brief moment, I left my house early and took a detour to Coffee By Design, the only place in the whole state of Maine that represented Luke's for the day. Three cars followed right behind me as I turned onto the street, all with drivers impatient to get their Gilmore on. Because parking was nil, I had to pull over and wave them on and they were not amused. The line of potential coffee drinkers standing outside shivering from the morning chill was out the door, down the street and heading around the corner. I snapped a picture of the line, my only proof that I was this close to getting my coffee fix with those who would truly understand. 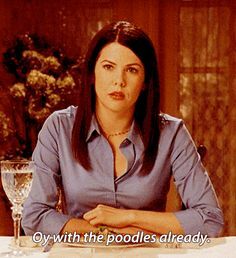 Sadly, I had to continue on my way to my pesky day job where my coworkers would barely blink over an “Oy with the poodles already” reference. 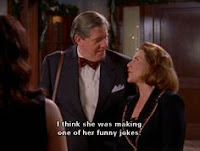 My daughters, who grew up on GG and aspire to talk half as fast as Lorelai and Rory, are poised to tune in. My husband is also a fan (though not of fanatic level) and already knows to sit silently and to only ask questions during breaks that I will allow. We are oh, so ready. Are you? Have you prepared for the barrage of subscribers that will be knocking on your virtual door in the next month? By the photos and videos on Instagram, Twitter and Facebook, I believe you could safely say there were hundreds of fans at every coffee shop representing Luke’s for a day. The overwhelming enthusiasm for the simplicity of this event has made me even more aware of the implications. If this many GG devotees made it to their local coffee shops at “early – must kill early” in the morning just for coffee in a paper cup, what's going to happen on November 25 when the revival series is released? Are we going to break you, Netflix? I already know others who plan to latch on to your service for the sole purpose of drinking in every moment of the four-episode GG revival series set to release the day after Thanksgiving. Will you be able to handle it? Will thousands of us be screaming at our electronic devices because we can't connect? Understand something about the GG society of fans, fanatics, whatever you endeavor to label us (we don’t care). We don’t want to watch the revival series the next day or a week later because something – anything - froze. We want to watch it the very moment it is available, then the next day, then a week, a month, and likely a year later. So Netlflix, I hope you’re ready for the Gilmore Girls tsunami of subscribers. I would advise you to make damn sure you've got your act together before November 25 because, believe me, you don't want to rile the multitude of viewers who are ready to hunker down for this marathon of epic emotions. We are all in. We are In Omnia Paratus - ready for anything (Life and Death Brigade… you shouldn’t have to look it up). As long as that “anything” doesn’t include being shut out on the 25th of November.